Lausanne’s bicycle sharing system is operated by PubliBike, owned by the Swiss Federal Railways (SBB/CFF), Postbus, and Rent-a-Bike. The Lausanne network includes some 24 stations, with most (10) concentrated on the university campuses. After registering, and a small annual fee (free for students), one uses an ID card to release the bikes from the station, and the first 30 minutes (90 for campus members) are free. I tried using PubliBike as one part of my daily commute, filling in the 2 km gap between Renens Gare (on the main train line) and the Géopolis building of the University of Lausanne. For six months (Jan. 1 to July 1, 2016), I kept records on my success in using this service. 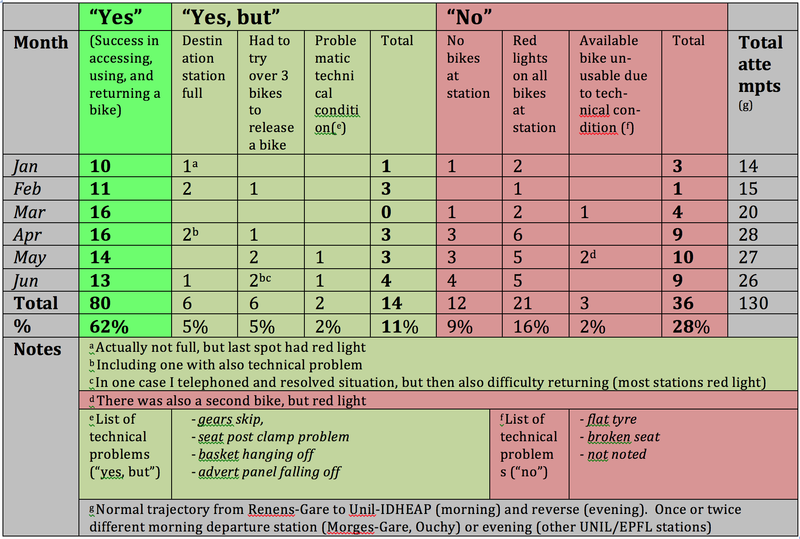 The results (full table below), based on 130 different trip attempts, aren’t very encouraging. Things went smoothly less than two-thirds of the time (62%). An additional one out of ten trips (11%) I succeeded in getting from point A to B but with some issues along the way. But that leaves more than a quarter of my trips (28%) as failures. Generally this meant I wasn’t able to access a bicycle – either there were none available at the station, or the station wouldn’t release the bikes present. The indicator lights beeped red instead of flashing green. January to March were more successful than April to June, with 16 percent “fails” in the winter versus 35 percent in the spring. 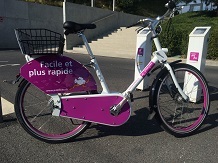 PubliBike had a number of technical difficulties with the electronics of the stations in May (and offered subscribers 4 additional months for free). This also explains some of the difficulties in getting bicycles: some times I had to try three, five, or even eight bikes before the posts would “beep green” and release a bike. The good news is that the technical condition of the bikes was generally good. And compared with last year (when I didn’t keep records), the supply of bicycles at Renens-Gare in the morning rush-hour was better. And while I usually just zip back and forth between Géopolis and Renens-Gare, the PubliBike system allowed for some pleasureful alternative commutes, along the lake from Morges or Ouchy to campus. Luckily, when I wasn’t able to access a bike, there are plenty of alternative options between Renens Gare and Géopolis: the light rail M1, the bus 31, or walking 15-20 minutes. But my conclusion is that I’ll be looking into a folding bicycle (here’s Simon Batterbury’s excellent advice on Brompton vs. Birdy). This entry was posted on Wednesday, July 6th, 2016 at 12:35 am and is filed under Research, Sustainability. You can follow any responses to this entry through the RSS 2.0 feed. You can leave a response, or trackback from your own site. Two pieces of mail from PubliBike today. One via the post, thanking me for my blog and giving me a year’s extension to my subscription. Now that is some fast customer service! Thank you very much indeed! “Unfortunately, at the moment it is not possible to borrow a bike at most PubliBike stations. This is due because sometimes there is no connection to the Salt network because it has braked down. We do everything in our power to solve this issue as quickly as possible. Once everything is working again, we will notify you. Update: I said I’d get a folding bike. Instead I settled for an alternate, much cheaper strategy that avoids lugging 10kg into the crowded train and keeping an eye on it: I got a second-hand bicycle that I keep at the train station (thanks to Arturo at my local bike shop http://www.bikespot.ch/).